Wow! Sew Mama Sew Giveaway Day was a HUGE success. I had 518 comments left. Who knew cute little goldfish where in such high demand. I still have some in my stash so I might just have to do it again sometime. Thank you so much for answering my question, I have gained a lot of insight and have noticed a few misconceptions. I'll be doing some "mythbusting" posts over on the machine quilting blog to clear up those misconceptions. 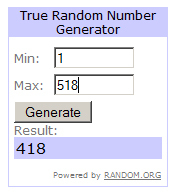 Thanks for a great giveaway and congratulations to The Average Quilter!